There is always a need to sharpen tools that have become blunt after many hours of use. Drill bits, cold chisels, gardening tools, center punches, and many others become blunt with repeated use. When I am faced with blunt tools, I often longed for a bench grinder, because that would be the ideal tool to sharpen back the tools. 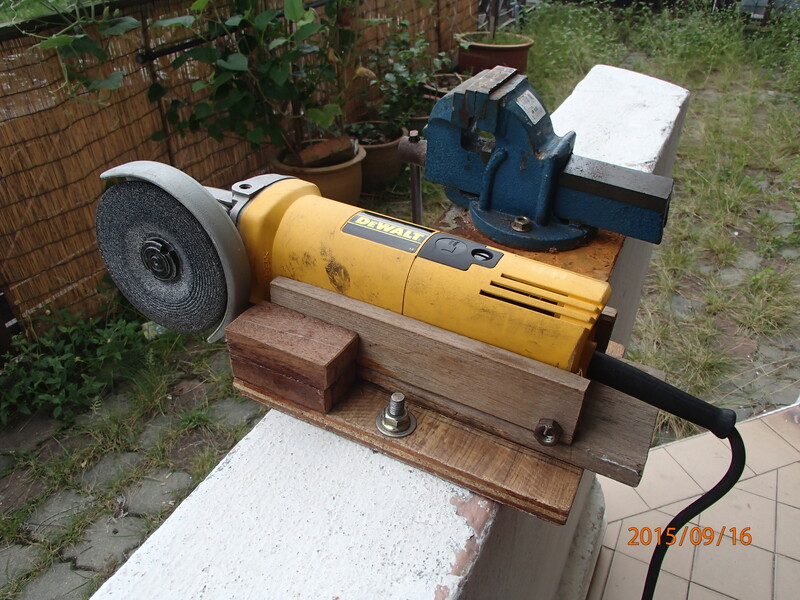 But I do not have a bench grinder. 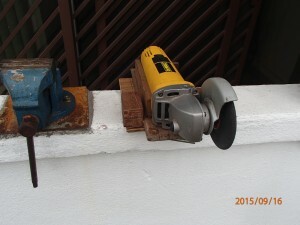 I only have a portable angle grinder. 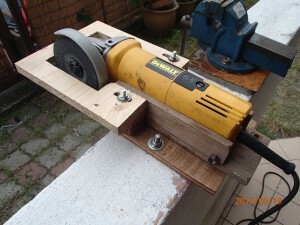 It still can be used for sharpening tools, but very often the results were not predictable, especially when I want to sharpen drill bits that require precision. The angle grinder is heavy and is meant to be held by the hands and to be used to grind a large area. Usually the side of the grinding wheel will be in contact with the piece to be ground. In comparison, a bench grinder is mounted on a fixed point and the edge of the grinding wheel is used for grinding. It would be ideal for grinding drill bits and for sharpening of tools as it can grind with more precision, because the operator does not have to carry the whole weight of the grinder itself. 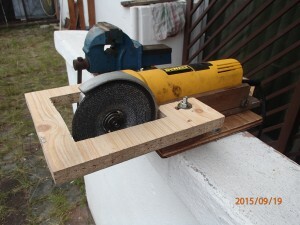 By installing a thin cutting wheel, the grinder can also be used to cut through materials without the use of a saw. My first step for converting an angle grinder to a bench grinder was to establish anchoring bolts to a solid brick low wall to secure the whole assembly firmly. Next, I made a sort of box-like structure out of wood to prevent sideways movement of the grinder. The angle grinder comes with a threaded hole for attaching a handle. 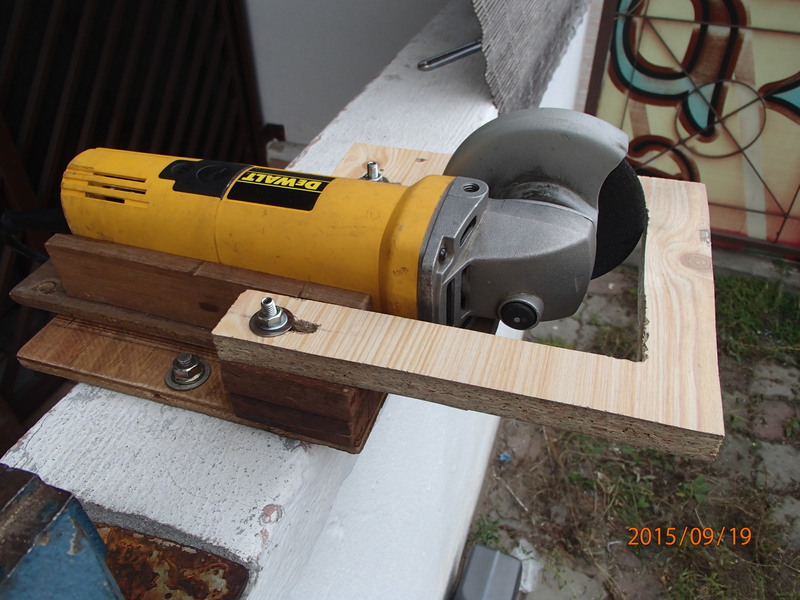 I found a bolt with the same thread and used this to secure the angle grinder to the wooden base of the assembly. 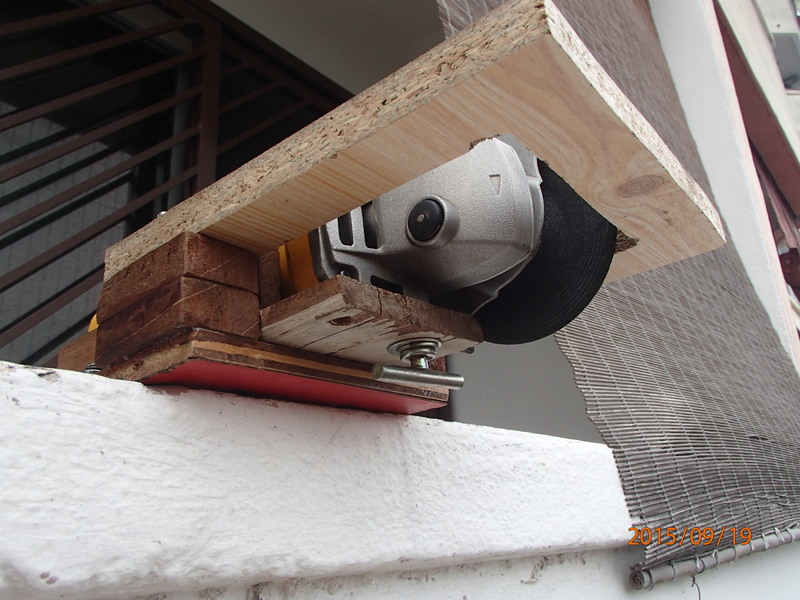 In order to avoid too much stress on the front part of the angle grinder, I glued a piece of wood at the back of the grinder so that former can rest on it when secured in place. Next, I measured the height of the base of the assembly to the center line of the grinding wheel and glued in some pieces of wood blocks at both sides of the grinder to the required height. In this case there were 2 blocks on each side. Once this was done, I did some measurement and then cut a U-shaped piece of MDF with my jigsaw to be used as a tool rest. In order to enable it to be adjusted for different sizes of grinding wheel, I made 2 slots on the tool rest so that it can be moved according to the needs. The bolts were carriage bolts. Once they were tightened up in place they were locked in place. The whole assembly looks rigid enough. 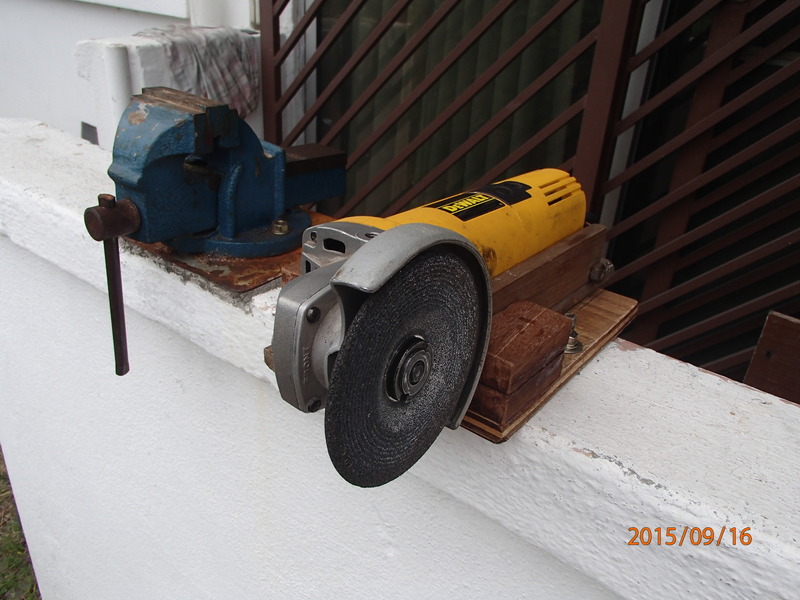 The whole assembly set up was tested with a new grinding wheel and it was found working satisfactorily.